This edited volume explores the relationship between the accelerating process of globalization and the proliferation of Weapons of Mass Destruction, which is increasingly seen as the pre-eminent threat to international security. The proliferation of Weapons of Mass Destruction has traditionally been seen as a function of the 'security dilemma' in the state-based international system. But the advent of the nuclear supply network pieced together by the Pakistani scientist A. Q. Khan represented a departure from this model, involving a variety of organizations not directly connected to a state. This volume assembles an international group of experts in order to assess the relationship between proliferation and globalization to ascertain how contemporary communication, transportation and financial networks are facilitating or constraining trade in dangerous contraband. 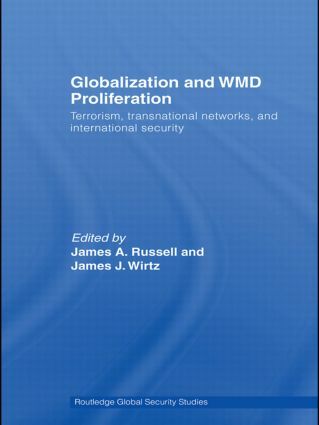 The book ultimately seeks to determine whether globalization is fundamentally altering the nature of the proliferation problem, particularly the threat that Weapons of Mass Destruction might fall into the hands of terrorists. This book will be of much interest to students of nuclear proliferation, international security, terrorism and IR in general.